According to truck commercials and the weatherman’s commentary, this weekend will be filled with picnics commemorating the end of summer. As such, I want to make sure each of you is prepared to take along a trendy salad to share with your friends and family, a truck salesman and if I had my way, Flip Spiceland. This recipe comes from a recent issue of Bon Appetit. I’ve made the exact recipe once and made a simpler (no green beans) version as well. You can do with this as you please but I do recommend sharing it. It’s really delicious. Before it’s too late, break out your white pants and shoes, grab the kale and get cracking. 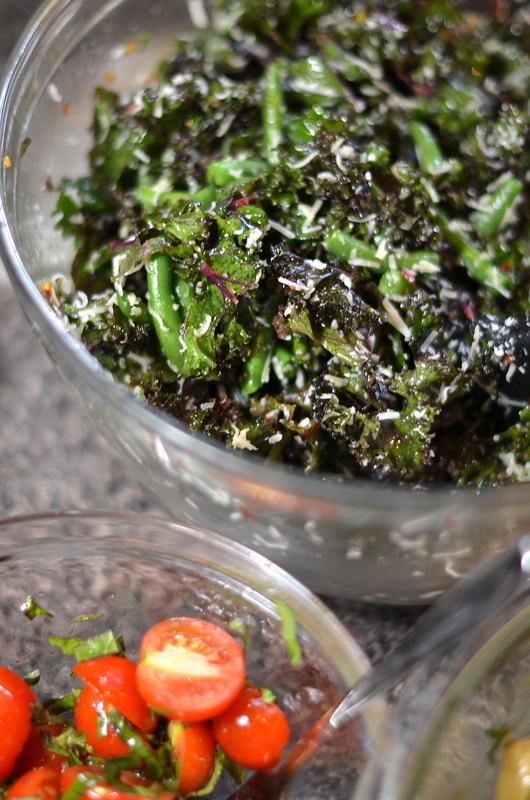 Grab your bunch of kale and pull the leaves from the big stems. Rinse well. 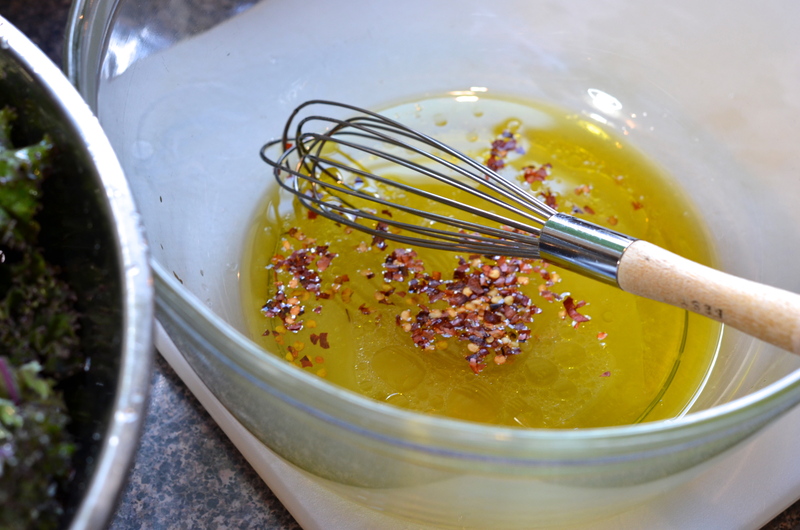 Grab a large bowl and combine the olive oil, lemon juice, honey and red pepper flakes. Add a pinch of salt. Grab the kale and toss it in with the dressing. Now it sits. 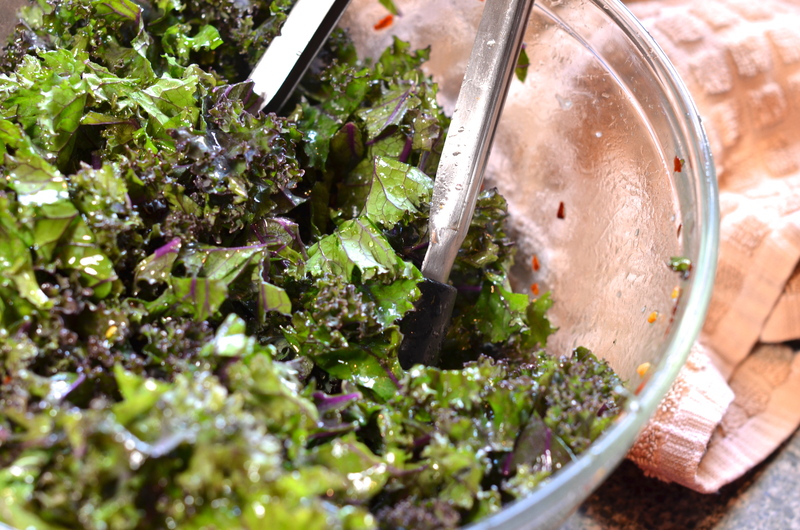 If you want a crunchier kale texture, then only let it marinate with the dressing for a couple hours. If you’d like for it to be more tender, then you can cover it and let it sit in the fridge overnight. As I said, you can opt out of the green beans if you’d like but they do add a nice bit of crunch and a bit of sweetness. If you choose to add them, all you need to do is give them a nice blanching and add them to the mixture above. To blanch the beans, bring a large pot of water to the boil and drop the beans in for 2-3 minutes. They’ll turn bright green and shouldn’t become soft. 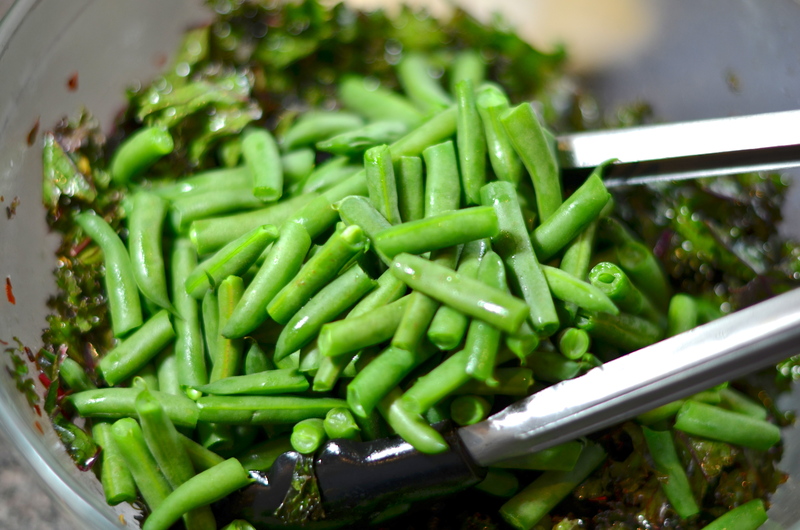 Have a bowl of ice water at the ready and drop the drained green beans into the cold water to stop them from cooking. 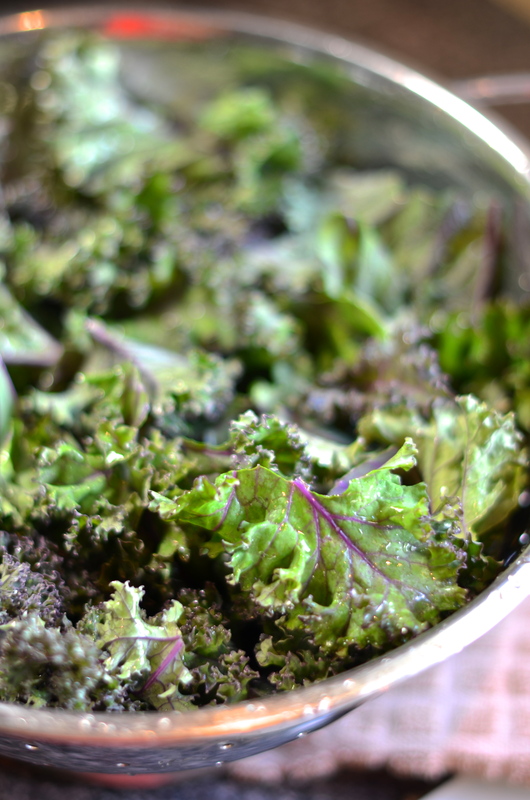 Drain, pat dry and add to the kale mixture. 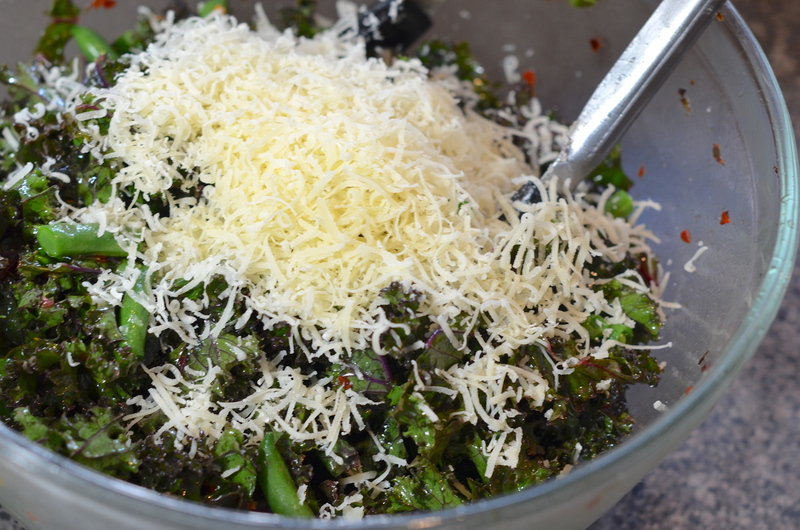 And now for the best part, add the 1/4 cup of Parmesan (you know, give or take a lot) to the greens and toss. Serve immediately, or pop back in the fridge until you’re ready to eat. This salad is great the first day and great the second day, if not just a bit more tender all around. We ate this with beer can chicken, a favorite, a French potato salad (recipe forthcoming eventually) and some cherry tomatoes tossed with olive oil, lemon juice, basil and blue cheese. Have a great Labor Day weekend and literal and figurative kickoff to the college football season. Life is good. Sigh….Flip Spiceland. And Kale Salad. Two of my favorite things all in one post. A perfect start to a Labor Day weekend. Thanks for sharing!